Home » Diet » Greens are Great! your rabbit with important vitamins, minerals and nutrients. Avoid a mono diet. 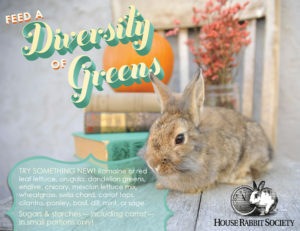 Two great rabbit-safe plant lists are linked at the bottom of this article. When introducing new foods to your rabbit go slowly to allow her body time to adjust. A guideline for serving size is 1 cup of greens per 2 pounds of body weight. Greens may be fed once per day or divided into multiple feedings per day. Use caution when feeding vegetables in the cabbage family. These include: kale, cabbage, bok choy, broccoli, brussels sprouts, collard greens. For some rabbits they can cause painful gas. Many of these dark leafy greens are also high in calcium. Rabbits are at high risk for calcium problems. 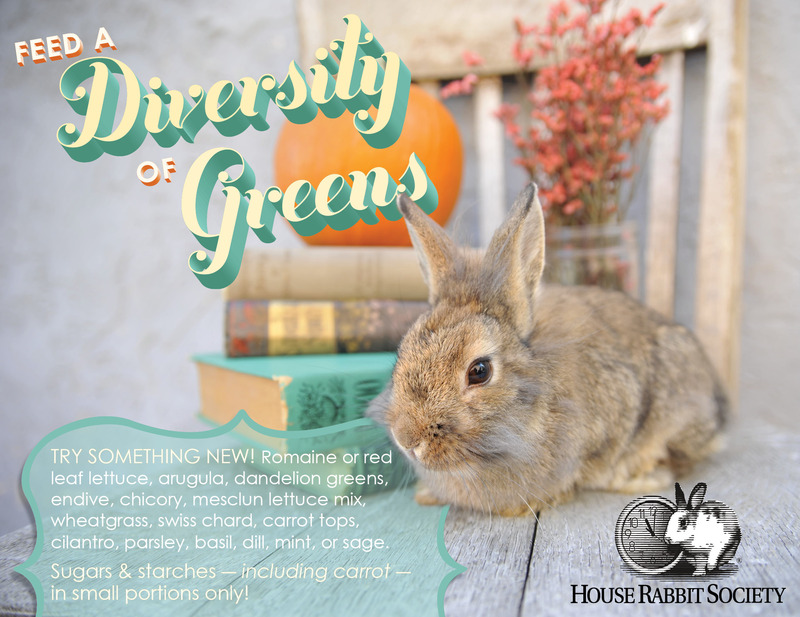 For this reason, most rabbit caregivers rotate their offerings and give breaks between high calcium greens. Some vegetables and all fruits are high in starches or sugars – including carrots! The sensitive gut flora in a rabbit’s stomach can be critically changed by sugar and starch. So limit carrot, fruits and dried fruits to a 1-inch portion only once per day. Do not feed iceberg lettuce, nuts, legumes (beans), yogurt, bread, crackers, seeds, popcorn, onion, garlic, potatoes, chocolate or rhubarb. Good nutrition lowers disease risk! And a direct association exists between diet and dental disease.